Coming along nicely! 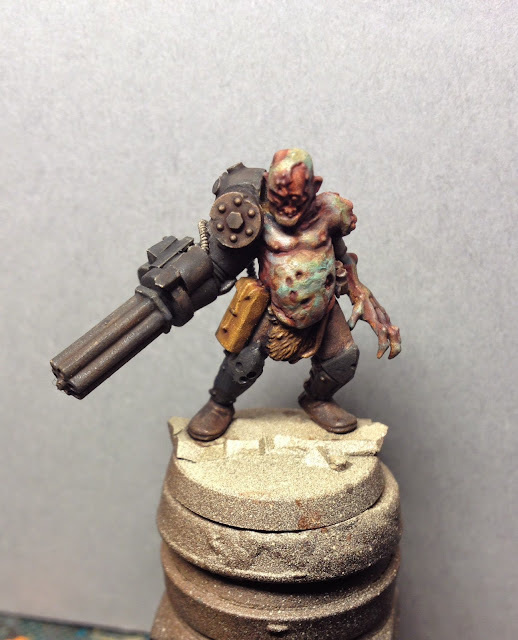 Theres something very therapeutic about painting nurgly flesh tones. I'm looking forward to a group shot soon of your recent nurgle offerings. Fantastic stuff, man - I've thoroughly enjoyed seeing this series of models come together. Can't wait to see more! Literally the worst name I have ever spent the last 15 minutes trying to pronounce! Loving it just like always Jeff. Yeah it´s a bit of a toungetwister isn´t it. I'm a bit of a newcomer to this blog, but I love what you do. Therefore I've nominated you for a Leibster Award. Brilliant, as always! You couldn't cobble together a recipe for your Nurgley skin, could you? It'd be much appreciated. Um... No. It´s such a painterly, back and forth process that´s it´s very hard stating a recipe. Ha, I thought as much! Thanks a mil. At least I hope it´s realistic - I´ve haven´t seen a hulking leprous cyborg devoted to a plague deity in real life.